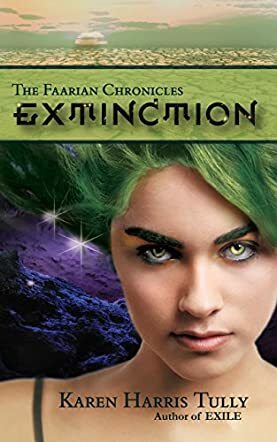 Extinction by Karen Harris Tully is the third and final book in The Faarian Chronicles Trilogy. The adventures of Sunny Price continue. Sunny once dreamed of being an Olympic gymnast but had her dream shattered because of her parents’ agreement that she would live on her mum’s planet once she turned 15. If you haven’t read books 1 and 2, you should do so before picking up book 3, otherwise nothing will make sense. After Sunny learned that her crush, John, like everyone else in his race, has a little spider living in his brain, her world turns upside down even more because some of his race also want her to be part of it (i.e. get a spider implanted). Females are a rare treasure for them. In addition, the Goddess Tiamat continues trying to convince Sunny that she needs to join her. As if those weren’t enough problems, the Anakharu turn into “Ferals”, wild, uncontrollable vampires that only want to feed. Her family and friends on Earth are on the run because the government suspects them of being in contact with aliens – which is true! There are no breaks for Sunny and everything is moving towards an epic climax during which incredibly difficult decisions have to be made. Just like books 1 and 2, Extinction by Karen Harris Tully is an excellent and entertaining read. I enjoyed joining Sunny and her friends one more time to see which path Sunny would eventually walk down. The author did quite well with adding some dramatic sequences and also did not shy away from hurting or even killing some characters readers might have grown attached to. Unlike many others, Karen Harris Tully understands how a trilogy should be structured. The plot is well thought through, makes sense and constantly adds to the excitement. You just don’t want to stop reading. There is a good mix of great, good, not so good and downright vile characters. Of course, there are also some who manage to kind of redeem themselves. After having read all three books of the series in about a week, I have no problem with recommending this series to people who love good YA novels that mix science fiction, fantasy, a little bit of romance, and coming of age themes.